THE WOMEN FARMERS' ENTITLEMENTS BILL, 2011 - Dilli Chalo! Leading agriculture scientist and Rajya Sabha (2007-13) member Prof. M.S. Swaminathan introduced The Women Farmers’ Entitlements Bill, 2011 in the house on May 11, 2012. However, this Bill, introduced as a Private Member’s bill, ‘lapsed’ on April 10, 2013. Prof. Swaminathan, in the Bill’s ‘Statement of Objects and Reasons’, said that with the gradual decline in the size of farm holdings, many rural men from poor families were migrating to cities and towns looking for work. This had led to “an increasing feminization of agriculture,” and women farmers experienced several handicaps related to land titles, access to credit, inputs, insurance, technology and the market. Women also constituted more than fifty per cent of Indian farmers and about sixty per cent of the farming sector’s workforce. Prof. Swaminathan proposed this Bill to safeguard the nation’s food security and strengthen the livelihood security of rural women, a majority of whom were engaged in crop and animal husbandry, fisheries, agro-forestry and agro-processing. The Bill sought to provide for the gender-specific needs of women farmers, protect their entitlements, and empower them with rights over agricultural land and water resources, and also access to credit, among other things. Who is a ‘woman farmer’? According to Section 2(f) of the Bill, a woman living in a rural area, who is primarily involved in agricultural activity but does non-agricultural activity occasionally, is a woman farmer. Women engaged in agriculture in urban and semi-urban areas, and tribal women directly or indirectly involved in agriculture, shifting cultivation or collection (of agricultural produce), and the use and sale of minor or non-timber forest produce, are also considered women farmers. A woman can be considered a ‘woman farmer’ irrespective of marital status and land ownership. What is a ‘Woman Farmer Certificate’?A Woman Farmer Certificate is proof of a woman’s status as a farmer. Section 3 of the Bill mandates that rural women involved in agriculture be issued a Woman Farmer Certificate by the gram panchayat after the approval of the gram sabha. In urban and peri-urban areas, an urban local body can issue the certificate, with the approval of an authority. A group of women can also get a ‘Group Women Farmers’ Certificate’. The certificate can be used as evidence in all administrative and judicial proceedings. 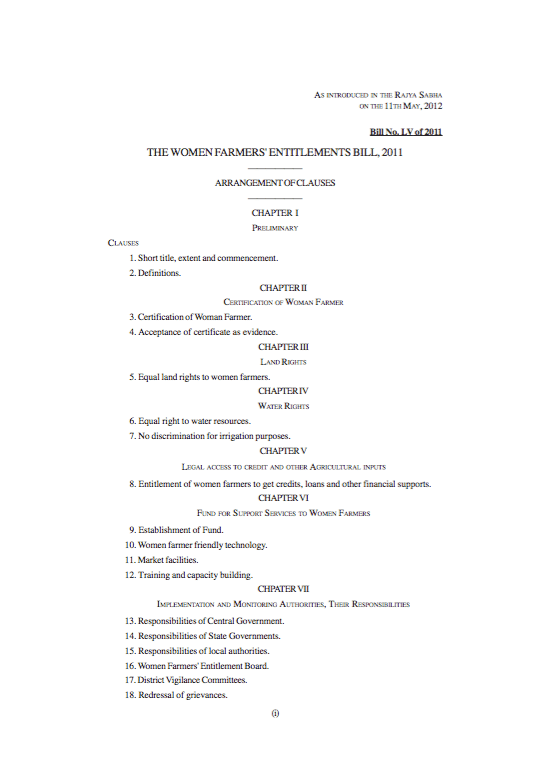 Which entitlements must a woman farmer have according to this Bill?Sections 7 says that a woman farmer shall have equal rights over all water resources as a male farmer. This applies to land that is owned by her, of which she is a shareholder, or which she uses for farming. Section 8 states that while accessing water for irrigation, a woman must not be discriminated against because of her marital status, religion, caste, possession or ownership of agricultural land. Section 8 says that women farmers, who have a Woman Farmer Certificate, would be entitled to a Kisan Credit Card, which is only available to male farmers. They would also have the right to credit and other kinds of financial support for agricultural activities. Section 6 of the Bill says that every woman farmer should have equal ownership of and inheritance rights over land acquired by her husband; his share of the family property; or his share of land transferred through a government land reform or resettlement scheme. What must the government do for women farmers?Section 9 of the Bill says that the union government must set up a Central Agricultural Development Fund for Women Farmers (CADFWF), which can be used to develop women-friendly farming technologies, train women farmers, organise capacity-building programmes, create market facilities and rural godowns, set up crèches and daycare centres, among other things. The government must also frame a social security scheme for women farmers that covers old age pension. What must the government do to implement the Act?Each state must set up a Women Farmers’ Entitlement Board at the state level and a District Vigilance Committee at the district level – both bodies will monitor the Act’s implementation and ensure transparency and accountability. State governments must provide mechanisms for the grievance redressal of women farmers at the block and district levels. What is the penalty for not complying with the provisions of the Act?Factoids and Focus compiled by Subuhi Jiwani. A person who does not comply with the provisions of the Act can be imprisoned for a term of not less than six months (but it may extend to a year) and be fined, or both.